When a washer makes a buzzing sound, the most common fault is that there is something stuck in the pump and blocking it. The buzzing sound occurs as the drain pump tries to run but something is blocking it and the “buzzing” noise occurs. As a blocked pump is the most probable cause for a buzzing washer, there can also be a other problems that can cause this noise. We will list the most common reasons for this problem beginning with the most probable first. If your washing machine is NOT buzzing but instead your washer is not spinning or draining during the cycle, then a different troubleshooting method is needed. Motor Coupling Broken: The motor coupling has broke and the motor turns but nothing happens. This will also cause a buzzing noise which can also be described as a vibrating noise. To fix this issue you will need to take the washer apart. Here is a video to show you what to look for if your washer motor coupler is broken. Once you know that the motor coupling is broken and needs replaced, we recommend ordering the part online. Simply do a search for “washing machine model motor coupler” and you will find the part needed for your specific washing machine. CAUTION: When troubleshooting your washing machine problems, always be safe by unplugging the machine and using common sense. Think SAFETY! The website RepairClinic has thousands of parts for your washing machine and has many troubleshooting methods to fix any appliance. 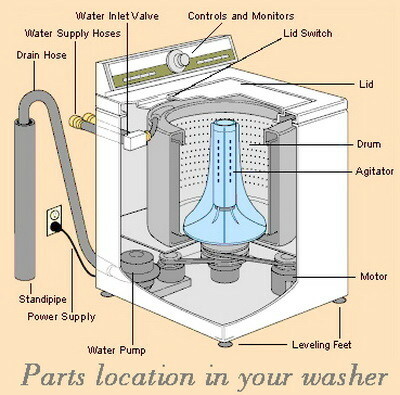 Another DIY appliance website is AppliancePartsPros which can assist you greatly when needing washing machine parts. If you have another probable cause for a buzzing washing machine, please leave a comment below to assist others. Maytag gas dryer #dg512. Circa 1989. Last year replaced a pr of solenoids when heat element was cutting off prematurely & has since been fine other than a buzzing from same area (similar to when timed out,) that neither solenoid fixed apparently. Only buzzes during heating flame part of cycle. Other wise all works perfectly. Selling house & would like to quiet it down. Happy Holidays too ! My Whirlpool washer #LSR8233JQ0 will fill with water. Then nothing but a buzz coming from control panel. Last time “start capacitor” failed. Technician said it was good and strong. I replaced the connections to the capacitor as everything was rusty. So removed pump and spun motor by hand. It will complete wash cycle and then stop again and buzz behind control panel. I tried setting it on spin after all water drained out. Spun motor in opposite direction, nothing. This “how to” helped me so much. Thank you! I have an Amana washing machine. The lights on the washers doesn’t come on. When I push start,all it does make a humming sound. But, water won’t fill the basket. The agitator doesn’t move. Best Advice I can give: Is the water on??? I’m so absent-minded, I personally forgot to turn the water back on after pulling the washer out to do some duct repair on my dryer. My Kitchenaid Superba only hums in the wash cycle. If I allow it to continue to hum the washer will shut down completely after a few minutes. I’m guessing that this a safety function to prevent further damage. If, while the washer is still humming, I shut the machine down manually, I can turn the dial to spin, it will spin and drain like it should. I’m thinking it is the motor?? Your thoughts. Could be a number of things causing the humming. We would suggest opening the washer up safely and checking to see if there is any obvious issues. Can you give us the Model number of your KitchenAid Superba washer? We can then help you with your issue in more detail. Belt broke on my top load washing machine. We replaced the belt now the washing machine will fill but once it goes into the wash cycle, it clicks but won’t agitate. Same on the rinse cycle. If we turn the agitator as it is filling, by hand, it will start but once it gets to the rinse spin cycle it will not start on its own. Lights are flashing. We have to unplug it, plug it back in turn the agitator by hand and it will finish the cycle. Each time it gets to the point were it is suppose to agitate or spin, it will click and then try to start a few times. Then the lights flash. Thanks for any help on this. May have a clutch or agitator dogs issue (plus your broken belt)… What is the model number of your washing machine? Washing machine has a Humming noise. But not with every load of wash. Kenmore Elite clothes washer, top-load, direct drive, model 110-24952300. Family of six (and the laundry is building up!). The humming sound occurs after the machine fills the tub with rinse water and attempts to engage the rinse / spin cycle. Again, this is intermittent. For example, today I ran the washer empty following a new part. Ran fine. We washed a load of table linens. Ran fine. I threw in a load of towels. Filled, agitated, drained, filled again, then hummed. The smell of a hot electrical motor was present, but not overloaded. This happens occasionally and I’ve been thinking that the motor is getting overheated after a heavy load or a few small loads and shuts down. Why do I think this? Because I can push timer switch in to turn it off, let it stand for 15-30 minutes, pull the timer switch out and the motor engages and resumes its cycle thru completion. Initial troubleshooting started with a new lid switch following little research effort. Same problems. Read nearly every DIY webpage and video and replaced a few parts to no avail! So, what does that leave?? I think something is burdening the motor that I cant identify or the motor’s mechanical (internal) components aren’t functioning properly causing it to overheat and shut down. What you got?? Thanks in advance for any help you can provide. Sounds like the washer drive motor is occasionally overheating from larger loads, therefore tripping the thermal overload circuit in the motor and making it stop working for a short period of time. Usually 30 minutes pass and the motor resets itself. That is why you can restart the washer after some time has passed. Try reducing the size of your laundry loads. If the issue happens even on small loads, then replace the motor or the thermal circuit as it could be faulty and therefore causing your intermittent issue. I have a GE top load washer that is making a buzzing sound around the control switch. It happens most of the time the wash is running in about every mode although I did not hear the buzzing in the rinse fill cycle. Any thoughts? Is the washer working properly besides the buzzing noise? If the timer motor is buzzing, that may be an indication that there is a bad spot on the timer motor. You can try opening up the control panel and inspecting the wires and the timer control and motor. If all the wire harnesses are secure in the control panel, and the buzzing persists, you may want to remove and replace it. If the washer is still working properly, you can leave it as is but in the near future it may fail and the washer will not go into certain cycles. I just replaced the door lock assembly on my Frigidaire infinity washer. Spin works now, but the door lock area makes a loud buzzing sound. I took it back apart and checked everything and put back together tightly. It buzzes worse. If I push on the door or hold it up slightly, it might stop briefly but starts up again. Seems to be a vibration buzz. Only read one other person online with this problem and it only said make sure it is tight and replace the striker. Have ordered striker. Any other ideas in the meantime? If the door buzzes be sure you put the correct OEM door switch in your Frigidaire washer. 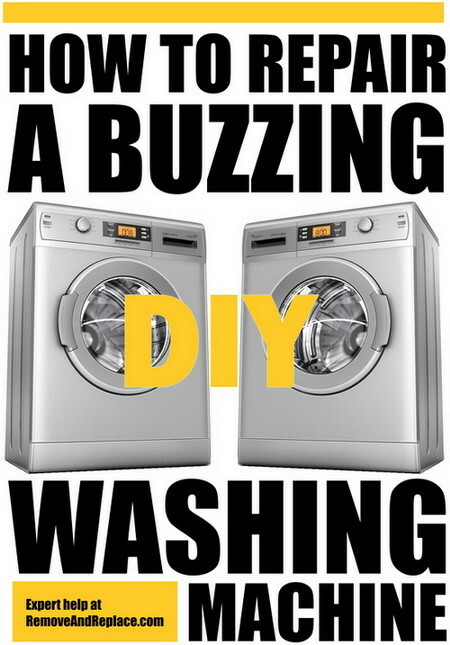 Some generic washer parts MAY NOT fit perfectly and therefore buzzing and vibration will occur. Either way be sure it is secure and tight or vibration may occur. Re-tighten the screws holding it in place. Also, be sure it is correctly in place and seated properly. If you do have an OEM part, and it is installed correctly, and the buzzing vibration persists, then yes a new strike may be needed. Also be sure the hinges on the washer door are tight as if these become loose the door can droop down and not line up perfectly and therefore cause the buzzing sound from vibration. I have had the exact same problem with my Frigidaire Affinity washer front load. Just replaced the plastic door clip and locking mechanism or switch. The door itself is dropping and getting hung up if not lifted up while closing, hence why I replaced door clip and lock mechanism in the first place. The parts were from Frigidaire direct and therefore OEM replacement parts. Definitely installed correctly. I am getting a very loud and obnoxious buzzing or vibrating noise coming from front of machine immediately after turning on. My wife is pregnant and won’t be happy until I resolve the issue. It’s very irritating to me and I can’t imagine how she feels listening to the noise every load of laundry. Any suggestions would be appreciated. If the door on your front load washer is drooping, be sure the hinge portion is tight and secure. If the hinge is bent or has loose hardware, it will cause the door to droop and may be causing the buzzing noise while the washer runs. Check hinge for loose hardware or possibly being bent downward. Secure the hardware or replace door hinge. If buzzing persists, check to be sure door locking mechanism is secure and properly in place. I have a Whirlpool washing machine. It makes a buzzing sound from the bottom, but it is not an exact or patterned noise. Sometimes loud sometimes not. Sometimes it will make the noise and then “catch” noise goes away and washer continues to work. Other times it will make the buzzing sounds and then shut off like a relay or something overheating, then when it seems it has cooled down it will click and start on its own. Sometimes it will finish the entire cycles and load sometimes it will shut down again and then come on later. It doesn’t seem to just be before the spin cycle, but that is when it happens most often. It does seem to happen anytime the drum needs to spin, agitate or the other motion it makes when draining. So just not sure what it is. The washer actually works and completes load all the way without it buzzing, shutting down and then starting back up where it left off. Initially when this started happening I thought I had smelled an electrical burn smell, but as this has gone on for a little while when it happens and shuts off or keeps running i do not smell the electrical burnt smell. I tested the lid switch with multi-meter and the ohms checked out, meaning the switch is okay, per the meter reading of 0.03 -0.00, than open lid and infinite. So seems like it is not the switch and the noise comes from the bottom of the washer. Any help before i drop $500 on a new washing machine? Whirlpool top load Supreme 8 cycle 2 setting washing machine. Is the sound more of a buzzing (electrical) or a humming (vibration) sound? Sounds like you may need to inspect and test the motor. If the lid switch is working properly and the washer changes, works okay sometimes and sometimes not, test the motor and cap if applicable. When you say it sometimes shuts off, at what exact point does it USUALLY shut off? Can you supply us with your Whirlpool Top Load serial number? I have the same problem – humming sound after wash cycle. washer wont drain. The humming sound is intermittent. It would hum, stop for a while and hum again. Like the machine is trying to do something but something is preventing it. After an extend time, it just starts draining/spinning and completes the wash cycle. I checked the pump suction and discharge but there was nothing wrong. I checked the the pump itself and it seemed fine. I moved the impeller with my fingers and it turned fine. I am a couples away from buying a new set. Any help is appreciated. my son overloaded my washer, I found it all moved around from being off balance I assumed. I turned it on and it was making a loud noise. found youtube video, took apart, and found the motor coupler broke, I replaced that and put back together. now it is just making a light buzzing noise. before I couldn’t even turn the agitator with my hand, but now I can. But it still doesn’t spin. When I had it apart, I noticed that some oil leaked from transmission.. Please help! what do I need to do now!! Found a sock from my 2 year old in the pump. Removed and working perfectly now. Thanks for your help!! Unplug the washer for 10 minutes and plug back in. This may reset an issue the washer is having. If this does not remedy the problem, let us know where the buzzing is coming from. (Panel, Motor, etc). Oh my God this article is awesome, my washing machine started acting up the motor wouldn’t do anything but buzz, I started thinking man oh man im gonna have to buy a new motor, 150.00 oh no, then I thought even worse a new washing machine, I read your article and checked my washer pump, my infant 1 year olds sock was lodged tightly in the pump and twisted it and got it out put it all back together and the washer is back in business you saved me a ton.